If you are resident of Al Nahda, Dubai or Sharjah, chances are you’ve been to Sahara Centre. I honestly think that this is one underrated mall. If you’ve never visited before, I suggest go and visit on a weekend, or park in the Dubai side of the road and enter the boundary gate which is used by people to cross over. Sahara Centre has it’s anchors shops like Spinneys, Debenhams, Home Centre, Adventureland, Fitness First and so on. It also has several fashion brands like Mango, New Look, Bershka, Tommy Hilfiger, Promod, and H&M among others. And there are several restaurants to choose from. Chilis, Applebee’s, Paul, Hatam, Chopsticks and Hatam to name a few. If you can overcome the traffic hurdle, I promise you that this mall won’t disappoint. I’m lucky living almost a few walking minutes away from Sahara Centre. Unless I’m very sure I won’t get stuck with traffic, I’d rather take the 10-minute walk. 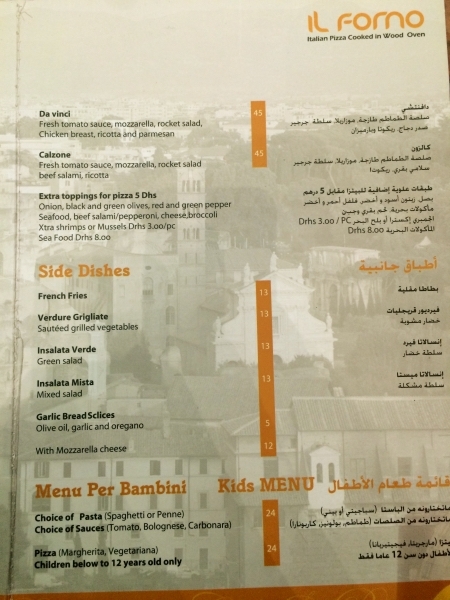 Anyways, this post is not about Sahara Centre but about my great dining discovery, the IL Forno Restaurant. Last night, my sister and I together with baby Biel went to Sahara to buy some game items I’m organizing for my cousin’s baby shower. Gibson also went straight to Sahara after his basketball game to pick us up but you know how girls are, we ended up stopping on almost all store that has ‘Sale’ plastered on their window 😺 and we’re not done yet when he arrived. Being the loving wife that I am (😍), I know he was starving so I suggested eating first before we continue our shopping. We tried almost all fast food chains and restaurants in Sahara over the years that we’ve been living in this area. 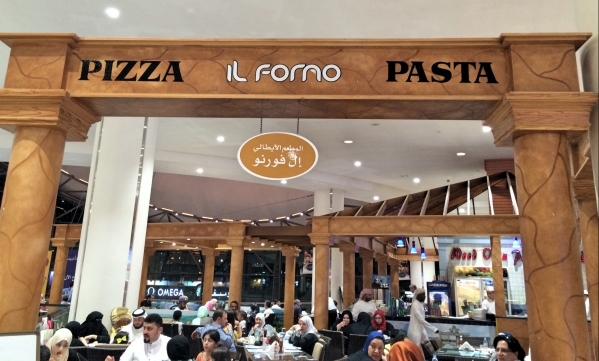 IL Forno Restaurant is located just beside the food court and I’m not exactly sure why we never tried this place. I think because we always dine to well-known restaurants like Chilis, Applebees, Paul and Chopsticks which have several branches across UAE. It’s sticking to the ones you’re already familiar with. But one good thing about my blogging hobby is I’m now always on the lookout for something new. And I’m glad I did try IL Forno. The facade of the restaurant is simple but I love that I feel like eating al-fresco within the comfort of an air-conditioned mall. The restaurant was beaming with diners last night. Here’s the menu pic as usual. 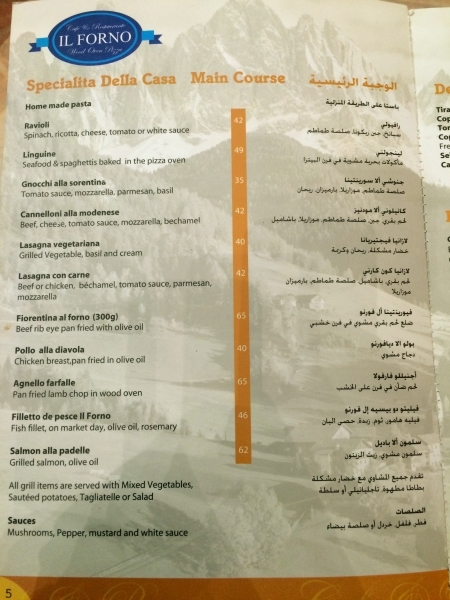 We all noticed that the price is a little bit lower compared to restaurants we’ve tried with similar menu. 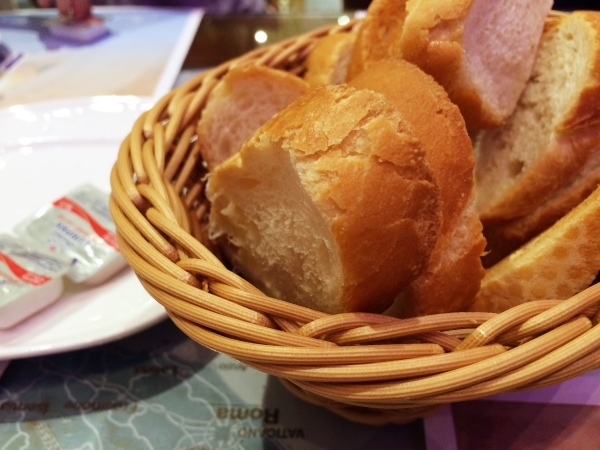 While waiting for our food, they gave us a basket of fresh toasted bread and butter. 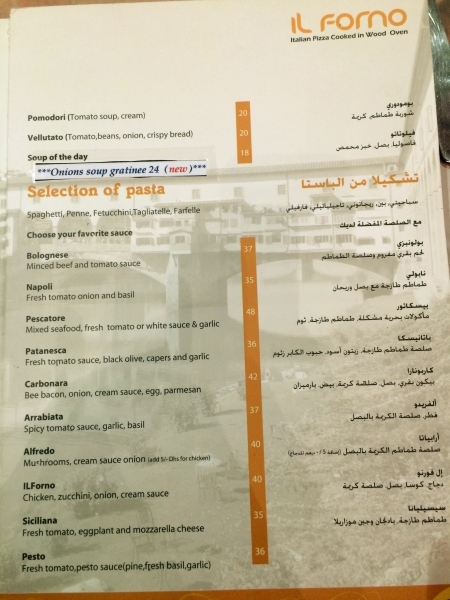 For our main courses, we asked the waitress what’s their best seller pasta dish. She immediately said Pescatore which is mixed seafood with either white or tomato sauce. She suggested combining the two sauces and we agreed. 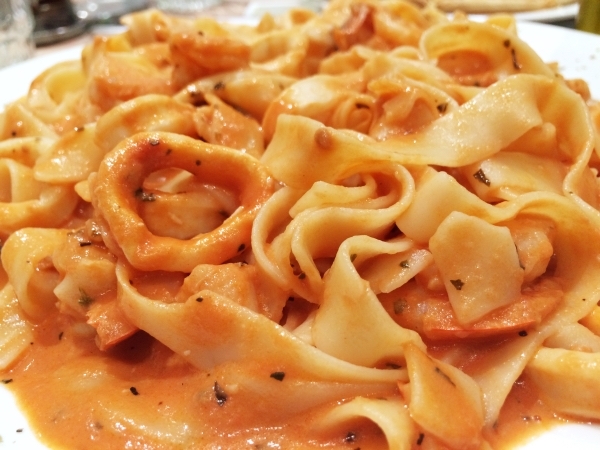 For pasta type, we settled for fettuccine. And be warned, the serving is almost good for 2. 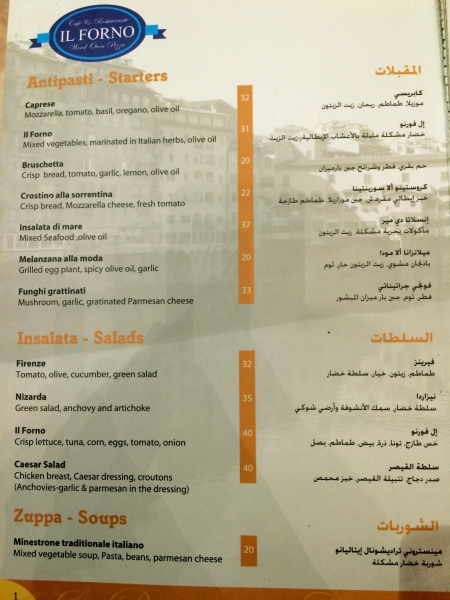 I was surprised they’re only charging 48 dhs for this meal. It’s so good, they were enough seafood on every forkful and the serving was huge! One thing we should always remember is that good food can come even from simplest places. Then Gibson ordered grilled salmon. 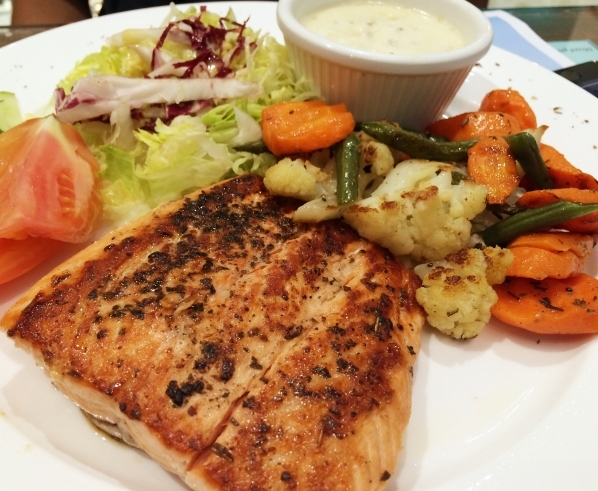 The waitress asked for choice of side dish which has the option of either mashed potato, mixed vegetables, french fries, potato wedges or pasta with white sauce. He chose the mixed vegetable. I’m not really a fan of salmon but I can say that this was also good. The vegetable and fish were seasoned and cooked well. For myself, I ordered ribeye steak. The waitress and I had quite a discussion on how to cook my steak. I said I prefer it medium-rare. She told me that I can have it medium-well and warned me that it will be pinkish. I thought that we were describing the same medium rare that I have in mind so I agreed on her suggestion. Well, to make the long story short, I had my steak medium well instead of my medium rare preference. Don’t get me wrong, I still enjoyed the steak. 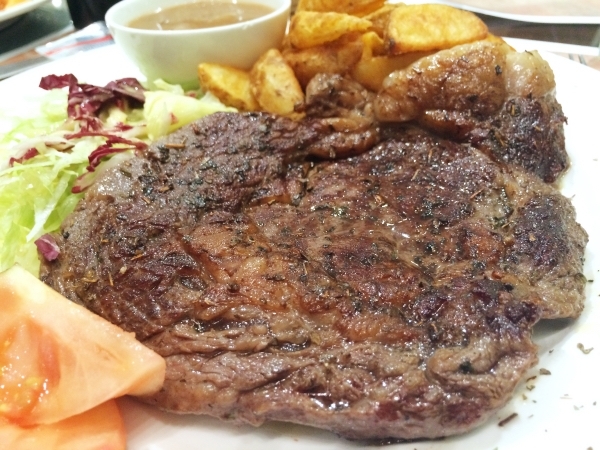 The serving was huge, the accompanying mushroom sauce was great and side dish I chose which was potato wedges were crisp. BUT I WANT MY STEAK MEDIUM RARE PLEASE. No, I’m not mad. Just stating my point.😑 I’m also not the type to request for food replacement unless it’s inedible. My daughter ordered the kid’s margherita pizza but since she’s more fascinated with my potato wedges, we just brought it home and was devoured by her kuya for his breakfast this morning. No leftover. Can I tell you something? This pizza tastes exactly as the pizzas we had in Rome. 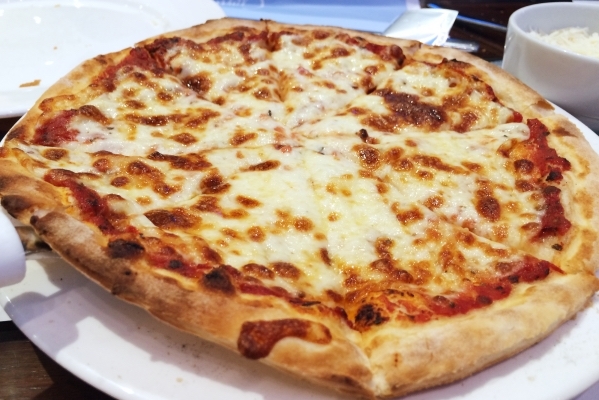 The dough and the simplicity of the taste made us compare it with the ones we had in Italy. We will definitely try other pizza flavors next time. I’m glad we tried IL Forno. This is not high end restaurant but it’s a very good casual place to dine. They don’t have any branches (yes, I asked) so the only way to try this is go to Sahara Centre. 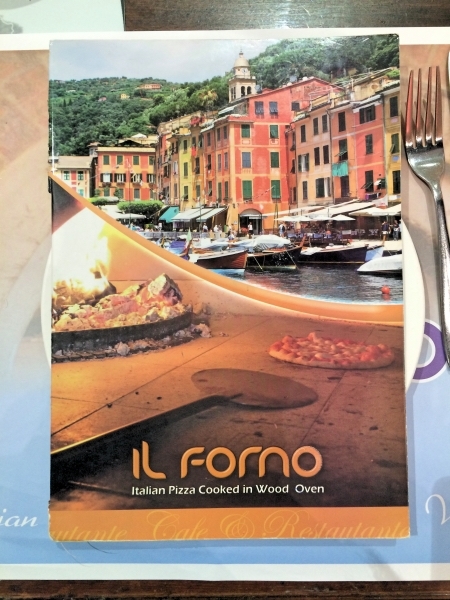 This entry was posted in Food & Dining and tagged Dubai blogger, dubai expat, filipina expat, filipino expat, IL Forno restaurant, Pinoy Blogger, Pinoy in Dubai, Sahara Centre, Sharjah.